Committee on Education and Accreditation: To promote and facilitate (inter-) disciplinary standards for accreditation, standardization and certification for professionals in Healthcare. To promote and facilitate scientific activities and collaboration between various professionals and professions involved the area of accreditation and standardization for medical simulation. To provide appropriate input for and content to the yearly DSSH Congress. Committee on Serious Gaming: To promote and facilitate initiatives contributing to the development and implementation of ‘Serious Gaming’ in Healthcare. To supports collaboration between soft- and hardware developers, game designers, ICT professionals, medical professionals in daily healthcare. To provide appropirate input for and content to the yearly DSSH Congress. 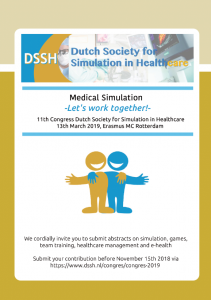 Committee on Scientific Research: To promote and facilitate the scientific character of the activities within DSSH and to promote and facilitate scientific activities and collaboration between various professionals and professions involved the area of scientific research in medical simulation. To provide appropriate input for and content to the yearly DSSH Congress.